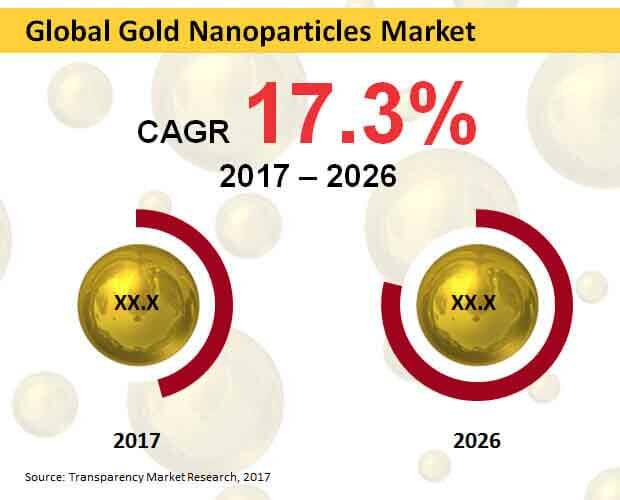 The global market for gold nanoparticles is highly competitive and is considered as consolidated in nature, owing to the presence of a few local and global players operating worldwide, states a new market intelligence study by Transparency Market Research. The leading players in the market are competing on the basis of product quality, distribution network, and creative developments. The key players are focusing on the research and development activities and technological advancements, which are projected to offer lucrative growth opportunities for the market players in the next few years. In addition to this, the increasing number of mergers and acquisitions and collaborations are estimated to enhance the overall competitive environment of the market in the next few years. Some of the key players operating in the gold nanoparticles market across the globe are Johnson Matthey Plc, Cline Scientific, Innova Biosciences, Meliorum Technologies, Inc., Sigma Aldrich, Nanocomposix Inc., Cytodiagnostics, Nanopartz Inc., TANAKA, and BBI Solutions. The global gold nanoparticles market is highly competitive and is considered as consolidated in nature, owing to the presence of a few local and global players operating worldwide, states a new market intelligence study by Transparency Market Research. The leading players in the market are competing on the basis of product quality, distribution network, and creative developments. The key players are focusing on the research and development activities and technological advancements, which are projected to offer lucrative growth opportunities for the market players in the next few years. In addition to this, the increasing number of mergers and acquisitions and collaborations are estimated to enhance the overall competitive environment of the market in the next few years. Some of the key players operating in the gold nanoparticles market across the globe are Johnson Matthey Plc, Cline Scientific, Innova Biosciences, Meliorum Technologies, Inc., Sigma Aldrich, Nanocomposix Inc., Cytodiagnostics, Nanopartz Inc., TANAKA, and BBI Solutions. As per the research study by Transparency Market Research, the global market for gold nanoparticles is projected to register a promising 15.0% CAGR between 2017 and 2026. On the basis of sales, the market is projected to witness sales in diverse applications and end use industries to exceed around US$8,000 mn by the end of 2026. The global market for gold nanoparticles has been categorized on the basis of geography into Asia Pacific, North America, Latin America, Europe, and the Middle East and Africa. Among these segments, Asia Pacific is estimated to account for a major share of the market and is predicted to remain in the leading position throughout the forecast period. As per the study, this region is likely to hold a share of around 30% of the market, thanks to the rising contribution from China, India, Taiwan, and Korea. In addition to this, this region is becoming the largest manufacturing hub for electronics and the support of government for the development of the nanotechnology industry are some of the other major factors that are predicted to enhance the growth of the Asia Pacific market in the next few years. Furthermore, the gold nanoparticles market has been classified on the basis of end use into electronics, healthcare, chemicals, and others. The electronics segment led the global market in the last few years and is predicted to remain in the similar situation throughout the forecast period. The rising demand for gold nanoparticles, owing to the rising adoption of compact mass storage devices is considered as one of the key factors projected to enhance the growth of this segment in the next few years. Gold nanoparticles are being used extensively for enhancing plastids in the plant biotechnology research, which is expected to act as a major opportunity for the market players. The rising number of applications of gold nanoparticles is another major factor that is predicted to enhance the growth of the overall market in the next few years. On the other hand, the strict rules and regulations by the international agencies, including National Institute of Standards and Technology (NIST), Nanomaterials Registry, and International Organization for Standardization (ISO) is predicted to restrict the growth of the global gold nanoparticles market in the next few years. Asia Pacific market for gold nanoparticles to witness high growth and attain leading position throughout the forecast period. The global gold nanoparticles market to observe a high level of competition in the next few years.